Many parents wait until a death occurs to work with their children on dealing with the idea of death. But that can be especially difficult if the parents are dealing with grief themselves. Taking time to reflect on your beliefs about death and your experiences with it, and then sharing those with your children helps them prepare for loss when it eventually happens, according to the National Mental Health Association (NMHA). Children deal with death in many different ways, and not necessarily in the same manner as adults. Preschoolers have difficulty understanding that death isn't temporary, but children between the ages of about 5 and 9 years begin to experience grief more like adults. You shouldn't be alarmed if your child reacts in any of these ways to a loss, the NMHA says. These are normal responses. In time, most children will return to the behaviors they had before the person died. Children, like adults, need time to grieve and be upset, the NMHA says. One of the most important things you can do is to let them know you're ready to listen, and provide reassurance they aren't alone in their pain. 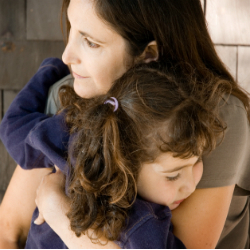 Don't try to protect your child from the grief you may be feeling after a loss. Allow your child to see what you are feeling. Children are concrete in their thinking. To lessen confusion, avoid expressions such as "passed on" or "went to sleep." Answer their questions about death simply and honestly, but only offer details they can absorb. Don't overload them with information. Death can make children fearful about the future. Give them a chance to talk about their fears and validate their feelings. Share happy memories about the person who died. Offer a simple expression of sorrow and take time to listen. Children need choices. Whenever possible, offer choices in what they do or don't do to memorialize the deceased and how they express their feelings about the death. You might offer to help them plant a tree or dedicate a place in memory of the person. Children tend to blame themselves. Emphasize to them that the death wasn't their fault and that there was nothing they could have done differently to prevent it. Explain that the person who died loved them and would want them to be happy. Some children need outside help to deal with their grief. Seek help from a school counselor, clergy or family and child counselor in your area if you feel your child needs more help dealing with the loss. If you recognize any possible signs of depression or suicidal behavior, seek help immediately from a mental health professional or your doctor.